The 2nd cumulative update release for SQL Server 2016 SP1 is now available for download at the Microsoft Downloads site. Please note that registration is no longer required to download Cumulative updates. A special thanks to Daniel Jones [daniel.jones.0543@gmail.com] for showing up interest and writing informative article for our blog (http://mssqlfun.com/). One of the most useful as well as hottest feature in SQL Server is mirroring of database. It is helpful for numerous of organizations that implements the successful as well as relatively high-availability of inexpensive strategies. However, in all the latest versions of SQL Server its service is being updated in numerous of ways such as database mirroring automatic page repair. It repairs the corrupt pages of the database. The automatic page repair is maintained by the database mirroring and Always on Availability Groups. After some specific types of errors, which had occurred in the database further make it in non-readable form. An availability replica tries to automatically repair the pages. The replica, which is unable to tread the page from another replica. If the request is implemented then, all the non-readable pages are replaced by the readable copies. It mainly resolves the occurrence of error. Note: The automatic repair is completely differing from DBCC repair as all the database is stored by an automatic recovery of page. Description: Action is executed only if the OS implement CRC (cyclic redundancy check), which fails on the data. Instances: Logical data errors like checksum of torn write or bad page. When an error of read comes up on a data page in the primary database then, the primary inserts row in the suspect_pages table with the correct status of an error. For database mirroring, the principal then, requests a copy of page from the mirror. For the Always On Availability Groups, the primary broadcasts the appeal to all the secondary’s and acquires the page from the first to react. The request identifies the ID and LSN, which is presently at end of flushed log. The page is marked as pending restore. This marks it inaccessible throughout the automatic page-repair effort. Attempts to utilize this page in the course of the repair attempt will fail with an error code 829. After getting page request, the secondary gaps till it has recreated the log up to the LSN stated in the request. After that, the mirror efforts to utilize the page in its database copy. If the page can be used, the mirror directs the copy of page to the principal. Otherwise, the secondary proceeds an error to the principal and the automatic page-repair effort fails. The primary methods the response, which holds the fresh copy of page. After the automatic page-repair effort fixes a suspect page, the page is noticeable in the suspect_pages table as reinstated. The input and output errors on pages, which happen on the secondary database are held in generally the similar way by mirroring and Always On Availability Groups. With mirroring of database, if the mirror comes upon one or more page errors of I/O when it rebuilds a log record, the session of mirroring arrives with the SUSPENDED state. Through Always On Availability Groups, if a replica of secondary meets one or more page errors of I/O when it recreates a log record, the secondary database enters the state of SUSPENDED. At that point, the mirror insets a row in the suspect_pages table with the suitable error status. The secondary then, requests a copy of page from the primary. The principal attempts to use the page in its database copy. If the page can be edited, the primary directs the copy of page to the secondary. If the mirror obtains copies of each page it has demanded, the secondary efforts to restart the mirroring session. If an automatic page-repair go fixes a suspect page, the page is clear in the suspect_pages table as reinstated. If secondary does not obtain a page, which is requested from the principal, the automatic page-repair effort fails. With mirroring of database, the mirroring session leftovers suspended. With Always On Availability Groups, the secondary database leftovers suspended. If the mirroring session or secondary database is restarted manually, the corrupted pages will be again hit at the time of synchronization phase. The mentioned dynamic management previews return rows for the up-to-date automatic page-repair efforts on a given availability database, with maximum of 100 rows per database. Gives a row for each automatic page-repair effort on any database availability on availability replica, which is hosted for any group availability by server instance. Returns row for all automatic page-repair try on any database mirrored on the server instance. It is important to repair the page to maintain the continuity of the work. Therefore, we have discussed Database mirroring automatic page repair in the above discussion that makes easy for users to remove the hurdle and understand it clearly. How Row versioning impact tempDB ? Scenario: DBA found that tempdDBdatabase usage is getting high and most of the size is consumed by row versioning. DBA raised the issue with application team running that query. Once Application team close the session, tempDB usage comes normal. As per BOL (https://technet.microsoft.com/en-us/library/ms175492%28v=sql.105%29.aspx) : Row versioning-based isolation levels (RCSI – Read Committed Snapshot Isolation) reduce the number of locks acquired by transaction by eliminating the use of shared locks on read operations. This increases system performance by reducing the resources used to manage locks. Performance is also increased by reducing the number of times a transaction is blocked by locks acquired by other transactions. Row versioning-based isolation levels increase the resources needed by data modifications. While updating the row in a table or index, the new row is marked with a value called the transaction sequence number (XSN), XSN is unique number and keeps updating with upcoming new command \ transactions. When updating a row, New version is generated. If DB is already having previous version of this row, previous version of the row is stored in the version store and the new version of the row contains a pointer to the old version of the row in the version store. New row version stores corresponding XSN value for reflecting the time the row was modified. All version stores are linked in a chain. SQL Server keep running clean up task to remove old versions which are not in use. As long as a transaction is open, all versions of rows that have been modified by that transaction must be kept in the version store. This is the reason due to which long running open transaction can cause huge tempDB row versioning space. Here, Row X is getting updated by multiple transactions (Tv,Tx,Ty,Tz) and each time new version store is created. When DB engine tries to clear old unused version stores, it found open transaction using version X. DB engine not able to clear any row version from version store after version X. Due to which TempDB size keeps increasing due to row versioning. Microsoft (R) SQL Server Execute Package Utility Version 11.0.6020.0 for 64-bit Copyright (C) Microsoft Corporation. All rights reserved. Started: 2:02:37 AM Error: 2016-12-19 02:02:37.91 Code: 0xC0209303 Source: ExcelImpot Connection manager “SourceConnectionExcel” Description: The requested OLE DB provider Microsoft.ACE.OLEDB.12.0 is not registered. If the 64-bit driver is not installed, run the package in 32-bit mode. Error code: 0x00000000. An OLE DB record is available. Source: “Microsoft OLE DB Service Components” Hresult: 0x80040154 Description: “Class not registered”. End Error Error: 2016-12-19 02:02:37.91 Code: 0xC001002B Source: MAPTImpot Connection manager “SourceConnectionExcel” Description: The ‘Microsoft.ACE.OLEDB.12.0’ provider is not registered on the local machine. For more information, see http://go.microsoft.com/fwlink/?LinkId=219816 End Error Error: 2016-12-19 02:02:37.91 Code: 0xC020801C Source: Data Flow Task 1 Source – Sheet1$  Description: SSIS Error Code DTS_E_CANNOTACQUIRECONNECTIONFROMCONNECTIONMANAGER. 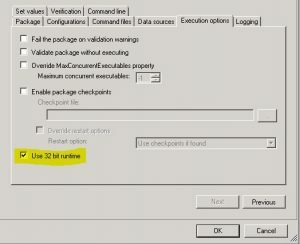 The AcquireConnection method call to the connection manager “SourceConnectionExcel” failed with error code 0xC0209303. There may be error messages posted before this with more information on why the AcquireConnection method call failed. End Error Error: 2016-12-19 02:02:37.91 Code: 0xC0047017 Source: Data Flow Task 1 SSIS.Pipeline Description: Source – Sheet1$ failed validation and returned error code 0xC020801C. End Error Error: 2016-12-19 02:02:37.91 Code: 0xC004700C Source: Data Flow Task 1 SSIS.Pipeline Description: One or more component failed validation. End Error Error: 2016-12-19 02:02:37.91 Code: 0xC0024107 Source: Data Flow Task 1 Description: There were errors during task validation. End Error DTExec: The package execution returned DTSER_FAILURE (1). Started: 2:02:37 AM Finished: 2:02:37 AM Elapsed: 0.733 seconds. The package execution failed. The step failed. Cause: This error occurs when you try to execute 32-bit environment package in 64-bit system. 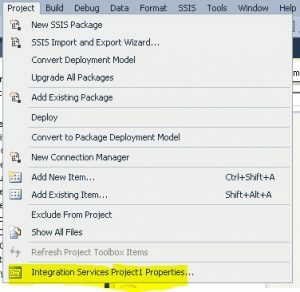 Solution 1: If you have project file of SSIS package or If you are running package other than SQL Agent jobs like calling from CMD. 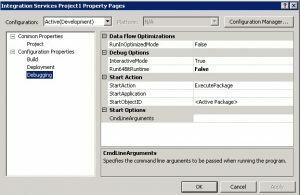 Step 1: Navigate to Project-> [PROJECT_NAME] Properties. Step 2: Navigate to “Debugging” option from left panel and from Right panel change Run64BitRuntime value to false. Solution 2: If you need to execute package from SQL agent job only then you have readymade option available. Go to Job step and check below option.